I am excited to share my diaper cake that's not really a cake! It just so happen to be a three tier non edible cake that's designed to pamper baby..... Literally! And it is made for royalty. I make all of my diaper cakes per order so it can be personal for your baby shower theme. I have sold them to guest and moms to be and we hope you can be next. 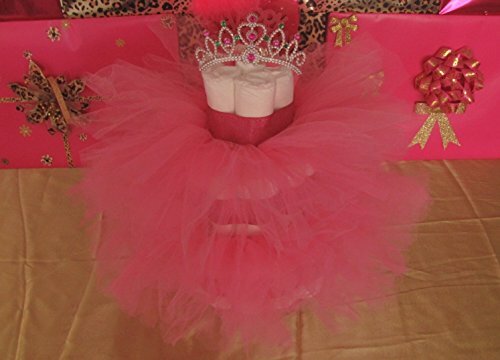 Your Princess cake is made up of 45 diapers made in three layers with handmade tulle tutu skirts for baby in two different sizes!!!! The elastic band is made to fit comfortably and we can't forget the crown on top, made for a pretty princess. Your cake will be approx. 15 inches tall and a bit over 2 lbs. Perfect for centerpieces or you gift table. You can choose from 5 colors for your personal royal diaper cake. Ordering process is pretty simple : 1) After you add your bike to your cart please specify what colors you would like your cake to be. 2)I will start production on you product immediately and will ship within 24-48 hours 3) Your estimated time of arrival is within 5 business days depending on your location and weather. If you have any questions about this product by Love Lee event planning, contact us by completing and submitting the form below. If you are looking for a specif part number, please include it with your message.